- NJPW World Cup Tournament (November/December '87) = Hiroshi Hase competed in the tournament, which was won by Riki Choshu. - NJPW Inoki Toukan Live III (December 27, '87) = Hase won the IWGP Junior Heavyweight Title, beating Shiro Koshinaka. - NJPW Top of the Super Junior '88 (January/February) = Hase lost in the finals to Shiro Koshinaka. - NJPW Sumo Hall (February 22, '89) = Hase fought to a Draw with Victor Zangiev. - NJPW Super Powers Clash (April 24, '89) = Hase & Shiro Koshinaka lost to the IWGP Tag-Team Champions, George Takano & Super Strong Machine. - NJPW Sumo Hall (December 7, '89) = Hase forced Habieli Victashev to submit. - NJPW In USSR (December 31, '89) = Hase lost in the third round, via submission, to Habieli Victachev. - NJPW Super Fight (February 10, '90) = Hase, Kantaro Hoshino, & Kuniaki Kobayashi fell to Tatsutoshi Goto, Norio Honaga, & Hiro Saito. - NJPW Sumo Hall (August 19, '90) = Hase & Kensuke Sasaki defeated Osamu Kido & Kengo Kimura. - NJPW Inoki's 30th Wrestling Anniversary (September 30, '90) = Hase & Kensuke Sasaki lost to Riki Choshu & Masa Saito. - NJPW Budokan Hall (November 1, '90) = Hase & Kensuke Sasaki took down Masa Chono & Keiji Mutoh. - NJPW New Japan in Iraq (December 3, '90) = Hase & Kensuke Sasaki fell to Riki Choshu & Masa Saito. - NJPW Sumo Hall (December 13, '90) = Hase & Kensuke Sasaki retained the IWGP World Tag-Team Titles, beating Takayuki Iizuka & Shiro Koshinaka. - NJPW Legends Show (December 26, '90) = Hase & Kensuke Sasaki lost the IWGP Tag-Team Titles to Hiro Saito & Super Strong Machine. - NJPW Starrcade in Tokyo Dome (March 21, '91) = Hase & Kensuke Sasaki lost the NJPW IWGP Tag-Team Titles to the Steiner Brothers. - NJPW Sumo Hall (April 30, '91) = Hase & Kensuke Sasaki were beaten by Riki Choshu & Tatsutoshi Goto. - WCW Clash of the Champions XV (June 14, '91) = Hase & Masa Chono lost to the NJPW IWGP Tag-Team Champions, the Steiner Brothers. - NJPW Sumo Hall (August 9, '91) = Hase & Kensuke Sasaki defeated Brian Pillman & Black Cat. - NJPW Sumo Hall (August 10, '91) = Hase & Kensuke Sasaki won over Osamu Kido & Kengo Kimura. - NJPW Sumo Hall (August 11, '91) = Hase, Tatsumi Fujinami, & Kensuke Sasaki fell to Bam Bam Bigelow, Scott Norton, & Big Van Vader. - NJPW Super Grade Tag League I (October '91) = Hase & Keiji Mutoh competed in the League, which was won by Tatsumi Fujinami & Big Van Vader. - NJPW Budokan Hall (November 5, '91) = Hase & Keiji Mutoh won the IWGP Tag-Team Titles from Rick Steiner & Scott Norton (subbing for Scott Steiner). - NJPW Super Warriors In Tokyo Dome (January 4, '92) = Hase was forced to submit to Antonio Inoki. - NJPW 20th Anniversary Show (March 1, '92) = Hase & Keiji Mutoh lost the IWGP Tag-Team Titles to Bam-Bam Bigelow & Vader. - NJPW Sumo Hall (April 30, '92) = Hase, Takayuki Iizuka, & Akira Nogami lost to Tatsutoshi Goto, Hiro Saito, & Super Strong Machine. - WCW Clash of the Champions XIX (June 16, '92) = Hase & Akira Nogami defeated the Headhunters (Arn Anderson & Bob Cook) in the first round of the NWA World Tag-Team Titles Tournament. 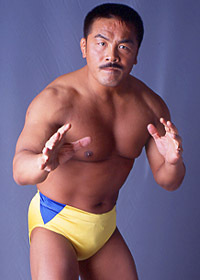 Nogami was later replaced in the tournament, due to injury, by Shinya Hashimoto. - NJPW Budokan Hall (June 26, '92) = Hase & Keiji Mutoh beat Takayuki Iizuka & the Black Cat. Later on, Hase pinned Kensuke Sasaki. - WCW Great American Bash '92 (July 12) = Hase & Shinya Hashimoto took down the Freebirds (Garvin & Hayes), then fell to Dustin Rhodes & Barry Windham in the NWA World Tag-Team Titles Tournament. Terry Gordy & Steve Williams won the tournament. - NJPW G-1 Climax '92 (August) = Hase lost in the first round to Terry Taylor. Masa Chono won the tournament. - NJPW Super Grade Tag League II (October '92) = Hase & Kensuke Sasaki lost in the finals to Riki Choshu & Shinya Hashimoto. - NJPW Sumo Hall (November 22, '92) = Hase, Riki Choshu, Tatsumi Fujinami, & Akira Nogami beat Masashi Aoyagi, Kengo Kimura, Shiro Koshinaka, & Akitoshi Saito. - NJPW Sumo Hall (November 23, '92) = Hase & Riki Choshu fell to the Hellraisers. - NJPW Fantastic Story (January 4, '93) = Hase was pinned by Sting. - NJPW Sumo Hall (February 16, '93) = Hase, Riki Choshu, Tatsumi Fujinami, Takayuki Iizuka, & Osamu Kido won a "Three Falls" Match over Samson Fuyuki, Ashura Hara, Takashi Ishikawa, Koki Kitihara, & Genichiro Tenryu. - NJPW Wrestling Dontaku '93 (May 3) = Hase was forced to submit to Yoshiaki Fujiwara. - NJPW Budokan Hall (June 15, '93) = Hase, Masa Chono, Riki Choshu, Tatsumu Fujinami, & Shinya Hashimoto won an "Elimination" Match over Tatsutoshi Goto, Ashura Hara, Takashi Iizuka, Genichiro Tenryu, & Super Strong Machine. - NJPW Budokan Hall (June 17, '93) = Hase took down Hiromichi Fuyuki. - NJPW Sumo Hall (August 2, '93) = Hase, Keiji Mutoh, & Akira Nogami defeated Kuniaki Kobayashi, Akitoshi Saito, & the Great Kabuki. - NJPW Sumo Hall (August 3, '93) = Hase beat Shinya Hashimoto. - NJPW Sumo Hall (August 4, '93) = Hase, Takayuki Iizuka, & Akira Nogami won over Masashi Aoyagi, Shiro Koshinaka, & Akitoshi Saito. - NJPW Sumo Hall (August 5, '93) = Hase took down Kengo Kimura. - NJPW Sumo Hall (August 6, '93) = Hase defeated Masa Chono. - NJPW Sumo Hall (August 7, '93) = Hase lost in the finals of the G-1 Climax '93 League to Tatsumi Fujinami. - NJPW Sumo Hall (August 8, '93) = Hase beat Yoshiaki Fujiwara. - NJPW Battlefield Yokohama (September 23, '93) = Hase was forced to submit to Genichiro Tenryu. - NJPW Super Grade Tag League III (October/November '93) = Hase & Keiji Mutoh defeated Masa Chono & Shinya Hashimoto, then beat Scott Norton & Hercules Hernandez in the finals to win the league. - NJPW Battlefield (January 4, '94) = Hase & Keiji Mutoh lost to the Steiner Brothers. - NJPW Sumo Hall (February 17, '94) = Hase, Masa Chono, Riki Choshu, Tatsumi Fujinami, & Osamu Kido won a "Three Falls" Match over Tatsutoshi Goto, Kengo Kimura, Shiro Koshinaka, Michiyoshi Ohara, & the Great Kabuki. - NJPW Budokan Hall (February 24, '94) = Hase forced Tadao Yasuda to submit. - NJPW Wrestling Dontaku '94 (May 4) = Hase was beaten by Riki Choshu. - NJPW Budokan Hall (June 15, '94) = Hase & Power Warrior lost to the Steiner Brothers. - NJPW Sumo Hall (August 3, '94) = Hase pinned Shinya Hashimoto. - NJPW Sumo Hall (August 4, '94) = Hase fell to Power Warrior. - NJPW Sumo Hall (August 5, '94) = Hase lost to Shiro Koshinaka. - NJPW Sumo Hall (August 6, '94) = Hase took down Takayuki Iizuka. - NJPW Sumo Hall (August 7, '94) = Hase beat Tatsumi Fujinami. - NJPW Super Grade Tag League IV (October '94) = Hase & Keiji Mutoh again won the League, defeating Masa Chono & Super Strong Machine in the Finals. - NJPW Battle Seven (January 4, '95) = Hase & Keiji Mutoh retained the IWGP Tag Titles, beating the Steiner Brothers. - NJPW Sumo Hall (February 19, '95) = Hase, Riki Choshu, & Kensuke Sasaki fell to Masa Chono, Hiro Saito, & Hiroyoshi Tenzan. - NJPW Pyongyang Sports Festival, Night 1 (April 28, '95) = Hase pinned Wild Pegasus. - NJPW Pyongyang Sports Festival, Night 2 (April 29, '95) = Hase & Kensuke Sasake were beaten by the Steiner Brothers. - NJPW Wrestling Dontaku '95 (May 3) = Hase was forced to submit to Ric Flair. - NJPW G-1 Climax '95 (August) = Hase lost in the finals of the league to Keiji Mutoh. - NJPW Wrestling War In Tokyo Dome '96 (January 4) = Hase fell to Kensuke Sasaki. - AJPW Budokan Hall (July 25, '97) = Hase & Jun Akiyama defeated Jinsei Shinzaki & Johnny Smith. - AJPW Budokan Hall (September 6, '97) = Hase beat Tatsuo Nakano. - AJPW Showdown At The Egg (May 1, '98) = Hase was pinned by Jun Akiyama. - AJPW Budokan Hall (July 24, '98) = Hase & Maunukea Mossman lost to Toshiaki Kawada & Takao Omori. - AJPW Giant Baba Memorial Show (May 2, '99) = Hase lost to Toshiaki Kawada. - AJPW Budokan Hall (September 4, '99) = Hase was pinned by Akira Taue. - AJPW King's Road New Century '01 (January 28) = Hase & Genichiro Tenryu fell to Toshiaki Kawada & Kensuke Sasaki. - NJPW Wrestling Dontaku '01 (May 5) = Hase, Taiyo Kea, & Keiji Mutoh beat Masa Chono, Satoshi Kojima, & Hiroyoshi Tenzan. - NJPW Budokan Hall (June 6, '01) = Hase was pinned by Keiji Mutoh. - AJPW Budokan Hall (September 8, '01) = Hase, Mike Rotunda, & Steve Williams beat George Hines, Jim Steele, & Vampiro. - NJPW Indicate of Next (October 8, '01) = Hase & Keiji Mutoh lost to Jun Akiyama & Yuji Nagata. - NJPW Prefectural Gym PPV (December 11, '01) = Hase & Taiyo Kea won over Kenzo Suzuki & Hiroshi Tanahashi. - NJPW Wrestling World '02 (January 4) = Hase & Keiji Mutoh defeated Tatsumi Fujinami & Osamu Nishimura. - AJPW Budokan Hall (April 13, '02) = Hase & Hideki Hosaka took down George Hines & Tomoaki Honma. - AJPW Budokan Hall (August 30, '02) = Hase fell to Genichiro Tenryu. - AJPW Budokan Hall (August 31, '02) = Hase, Kaz Hayashi, George Hines, Keiji Mutoh, & Jinsei Shinzaki lost an "Elimination" Match to Koki Kitihara, Masao Orihara, Genichiro Tenryu, Steve Williams, & Arashi. - AJPW 30th Anniversary Show (October 27, '02) = Hase was pinned by Satoshi Kojima. - AJPW Budokan Hall (April 12, '03) = Hase & Masayuki Kono fell to George Hines & Gigantes. - AJPW Budokan Hall (July 19, '03) = Hase, Masayuki Kono, & Shigeo Okumura lost to Robbie Brookside, George Hines, & John Tenta. - AJPW Keiji Mutoh 20th Anniversary Show: Love & Bump (October 31, '04) = Hase & Kensuke Sasaki were beaten by Mitsuharu Misawa & Keiji Mutoh. - AJPW Giant Baba Farewell (February 5, '05) = Hase, Satoshi Kojima, & Takao Omori defeated Kaz Hayashi, Keiji Mutoh, & Kensuke Sasaki. - AJPW Pro Wrestling Love In Ryogoku (August 27, '06) = Hase, Satoshi Kojima, & Katsuhiko Nakahima won over Brother Yasshi, Suwama, & Taru.